The updated Facebook Android app allows you to change the visibility of your Facebook posts, even after being published. This is great, as it prevents you from losing likes or comments, by deleting and re-posting that status or image. Here’s how it’s done. Note: This will only work if you’re using version 3.3 of the Facebook Android app, which should be rolled out to most users by now. 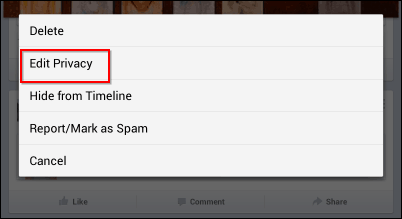 First, start the Facebook Android app and go to the post you want to change privacy settings for. Click the three dots on the top right side of the post. Now, in the menu that comes up, tap Edit Privacy. Now, select the group or privacy setting that you want for the post. That’s it! Sometimes it’s little changes like this that make a big difference when using an app.